This is an amazing recipe creation and so satisfying to the tastebuds! 😀 I created this recipe based off of this one and it turned out fabulous! It is rich even though it doesn’t have the same creamy texture as the recipe mom used to use with sour cream. This recipe uses coconut milk and is still very rich in flavor! I made it in a covered skillet on the stove and it worked out very well! One recipe serves 4-6, depending on the serving size. In a skillet or pan that you can cover, saute the onions and the garlic powder in 2 tablespoons of olive oil till tender crisp. In a separate container, mix the reserved broth (about 1 cup) and 1/4 cup more of beef broth to make 1 & 1/4 cup. Add the ACV, liquid aminos and onion powder. Pour over the onions in the pan. 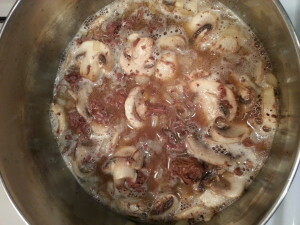 Add beef (chopped up) and mushrooms. Cook over medium heat for 10 minutes. In another bowl, mix together the tapioca starch and water. Stir well till it is smooth. Set aside. Shake the can of coconut milk really well. Open and pour out 1/2 cup. After the 10 minutes, slowly stir in the coconut milk, then the tapioca starch. 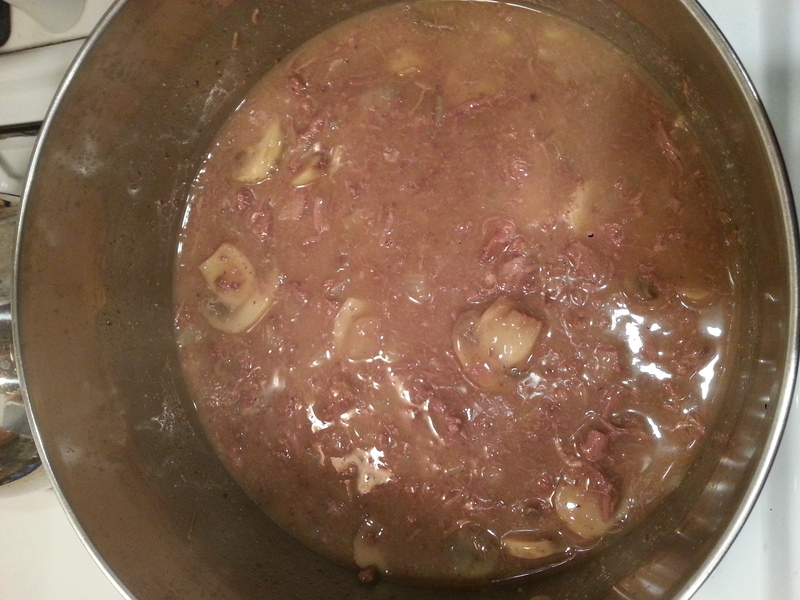 Cover and simmer for 10-15 minutes till thickened, stirring every so often. Serve over cooked brown rice, cauliflower rice, steamed spaghetti squash or zoodles (shredded zucchini). Please share which base you preferred using to pour this over! I’d love to hear your comments!